At the shrine of Eyüp, one of the Prophet Mohammad’s companions, and thus obviously sacred and sensitive, no one stopped women without a hejab from entering. Inside, various young women in jeans only had their hair covered. On the last day of my visit, the friendly warden sitting at the entrance of the Yeni Cami (New Mosque) near the bazaar, handed me a scarf matching the color of my blouse saying, “This one will suit you”! I felt at home in Turkey, especially as soon as people asked me where I was from. When I told them I was from Iran, they would be even friendlier. 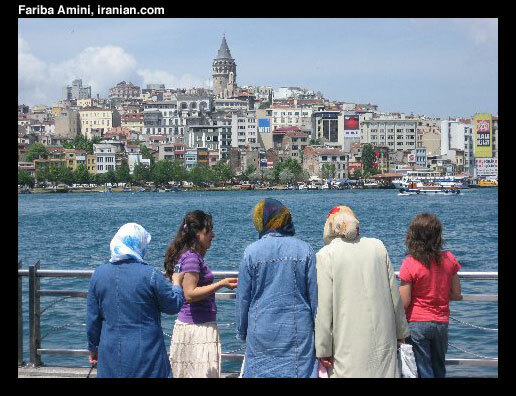 Istanbul used to be heavily polluted. Its air was foul with car exhaust; the industry-lined waters of the Golden Horn served as an open sewer, and toxic fish alerts were not uncommon. Things have changed dramatically, the result of years of good municipal management that started in the 1990s when Turkey’s current Prime Minister Erdog?an served as mayor. The city now boast many parks along the water front, even where the ferries dock the water was limpid, there was no trash floating around anywhere, and at least when I was there, the air felt clean. Istanbul’s transportation system is one of the best I have ever seen, even better than that of the capital of the United States. Ferries still take you everywhere along the Golden Horn and across the Bosphorus, between Europe and Asia, for a nominal charge. Buses run on time and all the time. The fast tram connecting the old city with the new across the new Galata Bridge is clean, efficient, and inexpensive at the equivalent of one dollar. Talking about clean, I noticed how clean the bathrooms were all over Istanbul and all the way towards the Aegean coast. Turks take great pride in their country, and while the political system is far from flawless, they enjoy basic freedom. 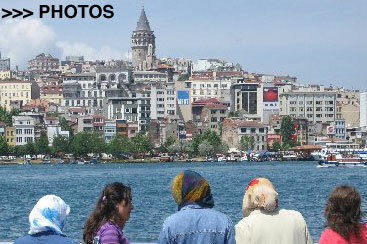 At dawn the echo of the call to prayer is heard from the mosques all over Istanbul and other towns. Though a bit annoying for waking you up, it also created an atmosphere, the unmistakable feeling of being in a place which, while modern, retains its traditional Islamic character. All over the city, men sell balal (corn) and other snacks from carts, all healthy food unlike what we see here in the US. Men and women mingle in cafes, stroll together in parks or sit together in the picnic ground. There are no guards to tell them to adjust their clothing or the stop enjoying themselves. During Friday prayer, hundreds of men sat on the grass in the garden outside a little mosque, near the famous Blue mosque and the magical Hagia Sophia in the Sultanahmet area, the inside obviously filled to capacity. They were visibly devout, though most of them were clean-shaven. Taking the bus to the Mediterranean coast was another wonderful experience. Following excellent, well maintained roads free from lunatic drivers, the luxury coach passed through several historical cities. Along the way, it stopped at rest areas with excellent facilities -- clean bathrooms again! At Canakkale, the bus went on a ferry across the Dardanelles, allowing the passengers to sip tea or fresh orange juice while enjoying the breathtaking views. At night, we arrived at the town of Ayvalik, (quince orchard), situated across from the Greek island of Lesbos (Mytilini). Ayvalik itself was wholly Greek once, but since their expulsion in 1923, is now inhabited by Turks. In this beautiful little port town people were even nicer than the big city. Everyone was helpful and the town seemed to be thriving and on the road to positive change. A frequent ferry connected the town with the island of Cunda, a few miles across, landing at a waterfront filled with laid-back cafes and restaurants. We went on an inexpensive all-day boat tour around the many little, uninhabited islands in the bay, allowing people to dive straight from the boat into the crystalline water. Lunch consisted of fried fish, salad, and water melon, all delicious and wholesome. The passengers, all Turks, young guys and women, most in bathing suits, a few in hijab, were enjoying the sun and the water. Like all young people I saw in Turkey, they seemed natural and relaxed. They danced to Turkish music, played backgammon and drank tea or beer. No one was rowdy; no one was dressed up and none of the women wore too much make-up. And of course, in Ayvalik as elsewhere, there was Ataturk; he was everywhere, his statue gracing every park, his picture hanging on all walls, appearing on coffee mugs, on coins and bills, on mosaics and flags, on billboards -- Ataturk is the essence of life and history in Turkey, and Turks know that what they have today they owe to him. After reading more about the man and his accomplishments I realized that what he did for Turkey, Reza Shah did not do for Iran. I was saddened to realize that Iran might have been where Turkey is today, as was the case in many ways thirty years ago. What the country has instead is an old man, the unsmiling “great leader,” ordering women to obey Islamic laws and to stay at home! The shameful and medieval act of public stoning is again practiced in Iran! More routinely these days, women are beaten because of their dress code or taken to jail, young men are assaulted and bloodied because of “criminal activities” in public, intellectuals living abroad are branded as spies and locked up without access to legal counsel when they visit their loved ones in Iran, and are forced to confess on TV and journalists are not allowed to use sensitive words such as “jonbesh,” “movement” because the Islamic regime is indeed afraid of movement, any movement. Those who want change either leave their country (243 Iranian journalists have left Iran in the last six years), or sit in prison waiting for a judge to hand down his ruling or for their families to come up with hefty bails. Meanwhile, Mr. Ahmadi Nejad, Iran’s suave, well spoken but not so good looking President, hosts Mr. Chavez of Venezuela, and together they tour the country, spreading their unpopular populist ideas and coming up with ways to deal with the Great Satan, only to give the US more excuses to attack Iran. While one is busy destroying the last vestiges of freedom, the other closes the media in his country that is critical of him.